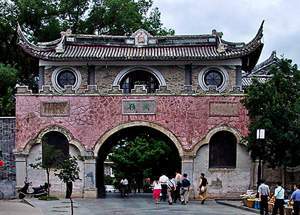 Wuling Gate (wǔ lǐng mén 武岭门), which is piled up by large stone piece with pink color, is with antique flavor. 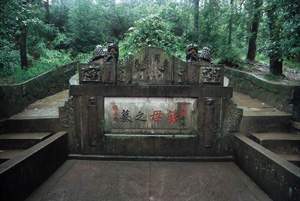 The eastern side of the stele on the gate was written by Yu Youren (yú yòu rèn 于右任), who was the founding member of the Kuomintang (guó mín dǎng 国民党), and the western side was written by Chiang Kai-shek. Go through the gate and turn left, there is the Wenchang Pavilion (wén chāng gé 文昌阁). The pavilion was first built during the reign of Emperor Yongzheng (yōng zhèng 雍正) of the Qing Dynasty (qīng cháo 清朝). Then in 1925, Chiang Kai-shek rebuilt it. The base of the pavilion is pile up by large stones, with the walls made of black bricks. 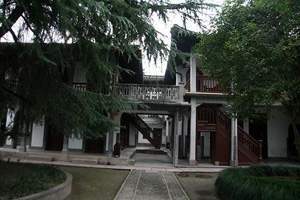 To the west of the Wenchang Pavilion, there is the Western-Style House. The house, which is a two-storey building, was built in 1930. 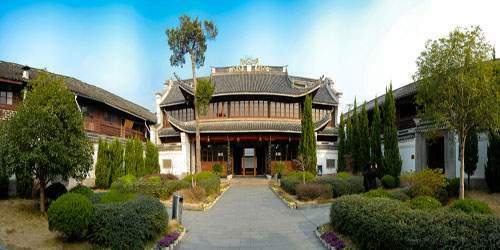 Standing at the foot of the Wushan Mountain (wǔ shān 武山) and facing the Shanxi River (shàn xī 剡溪), the house is in the quiet and beautiful environment. Mr. Chiang Jing-guo (jiǎng jīng guó 蒋经国) lived here after his return from Soviet Union in 1937. In the house there is a stone tablet on which there are four Chinese characters "以血洗血" (yǐ xuè xǐ xuè, means blood for blood) written by Mr. Chiang Jing-guo, which show his bitter hatred for the Japanese enemies and his will to avenge his mother's death. Located on the Middle Street (zhōng jiē 中街), there is the Fenggao House. Fenghua City The Fenggao House was the birthplace of Chiang Kai-shek and his son Chiang Jing-guo. The house covers an area of 4800 square meters. The structure of the house is typical traditional Chinese style with an antechamber, a chamber at back, two wings and four verandas. The middle chamber of the house is names as Baoben Hall (bào běn táng 报本堂), in which there are the memorial tablets of the four generations of Chiang’s great grand-father. On the beams and the pillars of the house, there painted pictures, which are mainly from the Chinese folklore. In the front courtyard there are three gardens, connected with each other by moon-shaped gates. The east wing-room was respectively the living rooms of Ms. Song Meiling (sòng měi líng 宋美龄). 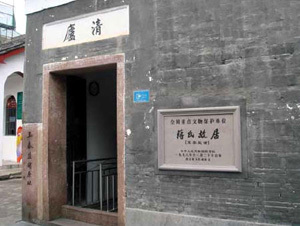 At the entrance of Zhangqiang Lane (zhāng qiáng nòng 章墙弄), on Xikou Middle Street, there is the Yutai Salt Shop. It is the birthplace of Chiang Kai-shek. The Shop, which is a stone building, was the property of Mr. Chiang's father and grandfather. On the horizontal board of the shop’s gate, there were inscribed two Chinese characters "清庐" (qīng lú, means Quiet Cottage), and on the cornerstone at the front are the words "the original site of the Yutai Salt Shop”(yù tài yán pù yuán zhǐ 玉泰盐铺原址), written by Mr. Chiang Kai-shek. 1000 meters away from Xikou Town, there is the mausoleum of Chiang’s Mother. There is an stone archway in front of the mausoleum, in the center of which there carved four Chinese characters “蒋母墓道"(jiǎng mǔ mù dào). Walk along the road for 200 meter, and then step up the stairs, there is a octagonal pavilion. To the right of which there are 12 houses. In the second house, there hanging the picture of Chiang’s mother and a stone tablet, on which there is the funeral oration written by Sun Yat-Sen (sūn zhōng shān 孙中山), and on the back there is the funeral oration written by Yu Youren, said by Chiang Kai-shek. The houses on the left are the residence for Chiang when he came back to his hometown. Opening hours: 8:00 a.m. – 5:00 p.m.
Transportation: you can take bus at the South Bus Station (qì chē nán zhàn 汽车南站) next to the Ningbo Railway Station (níng bō huǒ chē zhàn 宁波火车站) to get there directly, 9.5 yuan/person.